Hello Everyone! Stefanie here from The Petite Soiree. Today I’m bringing you some chic and Bohemian ideas on how to throw a very hip and fabulous Valentine’s Day Baby Shower. January, February and March are those very tricky, last-of-winter months – that can be a bit challenging to plan for since everyone is secretly yearning for spring but winter is still outside of the window. However, there are still ways to merge the best of the two seasons to achieve a fresh and very climate-appropriate look that will keep you feeling refreshed at your party and your guests pleasantly surprised. I love the look of a chic boheme baby shower with pink and red hues mixed in with doilies, thick fabric and fresh blossoms. Although the boho chic trend has been around for quite awhile now – I don’t see it dying down anytime soon in 2013, especially since I expect the folksy kitsch and “anthropologie” inspired look continuing this year. I hope you enjoy these ideas on how to pull together a very boho and chic Valentine’s Day Inspired Baby Shower. If you’re planning a baby shower or have planned a baby shower on Valentine’s Day – we would love to hear about how you planned it and what you think of this boho inspired look for a shower, in the comments below. Hello, chic “paper pom-pom keepsake parasol,” goodbye bow baby shower hat! I also love how fitting parasol umbrellas would look on guest tables to decorate the dinner table. Add a love letters sign in an area where guests can write sweet love letters to the baby-to-be and have sweet sugar cookie letters as favors next to them. Give the glowing parents a comfy and special place to sit with their very own dining table. Upholster chairs in a thick and rich boho-inspired fabric with plenty of pink and red hues to tie in the valentine vibe, that they can later use in the nursery. Use doilies as garland and make sure to add plenty of hearts throughout the room to represent the immense love there. For the dessert bar, serve typical sweets as well as healthier options for the mom-to-be – like these clever “strawberry skewers,” that look just like hearts when cut in half. Give heart shoe clip-ons for all of the women to wear at the party – or just for the special mom-to-be. No doubt this would be the perfect dress up accessory if she has a little girl! Serve these exquisite and “extra large” heart shaped macaroons for dessert that are sure to have guests swooning over how beautiful and different they are via Mad Baker. Finish off with a decadent ice cream or root bear float like this one on Style Me Pretty. Lastly, don’t forget to add a stellar pink velvet cake and luxe heart shaped balloons to finish off the room. The love will absolutely be in the air! Planning a party for Valentine’s Day? Let us know your greatest challenge when planning a party around the holidays, or how your V-Day party turned out in the comments below. You might even see it added to the pinboard. Stefanie Nieves is the owner & lead event designer of The Petite Soiree, an NJ boutique Event Design & Planning Co. specializing in Upscale Children’s Parties and Décor. 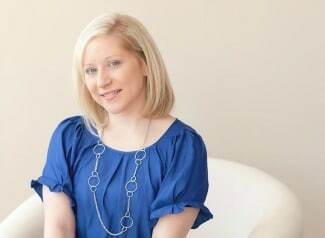 When she’s not planning parties, you can find her blogging about event trends, party ideas, and unique ways to make children’s parties more stylish and unique. This is such a pretty palette. I LOVE the parasol!